I have mixed feelings about Christmas. I enjoy the traditions, the nostalgia, the delicious food, the beautiful lights, the exciting gifts and some of the music. I despise the unapologetic, matter-of-fact way companies use the holiday to make money. I’m also pained by the growing superficiality of Christmas. The birth of Christ has become an afterthought. Nietzsche informed us that God is dead. I disagree, but suspect Christmas might be dying—slowly passing away in a blaze of colored lights and cacophony of seasonal music. Many people are appalled at what the holiday of Christmas is becoming. Fortunately, some of them have decided to do something about it. I’m always slightly wary of humanitarian organizations—it’s hard not to be a little suspicious of people who ask politely for your money and offer nothing tangible in return. The truth, however, is that most humanitarian organizations are doing amazing things to help people all over the world. One of my favorite humanitarian organizations is Living Water International, which for several years has been guilty of a conspiracy, a conspiracy founded upon three simple facts. 1. Americans spend $450 billion on Christmas every year. Four hundred fifty billion dollars. Every year. That’s a lot of money. 2. Lack of clean water kills more people every day than almost anything else. 3. The estimated cost to make clean water available to everyone on Earth is about $20 billion. Yes, that is about 4.5% of how much money Americans spend on Christmas every year. These are the facts. What do we do with them? The Advent Conspiracy is an initiative meant to raise as much money as possible to supply clean water to everyone on Earth, regardless of their geographical location, culture, race, ethnicity, religion or sexual orientation. How is that money raised? Well, people are encouraged to spend less money on Christmas—for example, making gifts or decorations instead of buying them—and giving what would have been spent on the holiday to the Advent Conspiracy. This is something big. It’s something heroic and awesome and way better than buying stuff that will spend 99.97% of its existence gathering dust on a shelf or in a closet. It takes a little self-sacrifice, true, but it changes the world. The coffee mug or DVD or fancy shoes you choose not to buy becomes safe, pure water for one or three or ten people for the rest of their lives. I don’t usually like churchy videos, but this one about the Advent Conspiracy is pretty cool. 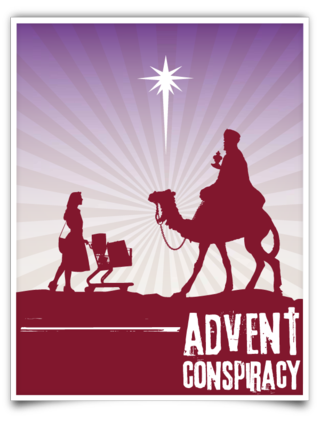 More information about the Advent Conspiracy can be found here. Have a wonderful, warm, meaningful, exciting Christmas season! A note for those who are wondering about the fate of my typewriter monkeys: The airport administrators assure me that my monkeys are on their way to Montevideo and should arrive within a few days. I think they’re currently somewhere over the Indian Ocean at this moment. They had better get back soon. Typing out these posts myself is hard work. This entry was posted in Faith and tagged Advent Conspiracy, Christmas, crazy idea, typewriter monkeys by Adam Stück. Bookmark the permalink. This is pretty fantastic. Well, it’s appalling that $20 billion would make clean water for entire world and we would rather spend it on candy canes, santa, wrapping paper, and bows. Thanks for putting it out there. I’m am passing it on to my small circle of influence.